Confirmation is a sacrament in the Christian initiation process. At present it may be celebrated as part of the Rite of Christian Initiation of Adults or as a sacrament separate from Baptism, in the case of those baptized as infants. Confirmation enriches those baptized with the Holy Spirit. As children reach 8th grade or above, we extend an invitation for them to prepare for and receive the sacrament of Confirmation through the Regional School or the Parish School of Religion Program. Adults, who were baptized Catholic but did not receive Confirmation around 8th grade may contact the rectory to find out how they may prepare for and receive the sacrament. 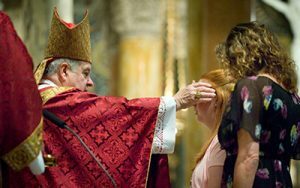 the Sacrament of Confirmation for Adults is offered at the Cathedral on Pentecost Sunday.